So how did it fare after the second wash? The blue background color is sharper and clearer, but the splash areas that were once light blue are now white. This does not diminish its attractiveness in my opinion, but I had been hoping to retain the light blue on indigo look that first caught my attention when I viewed it online. The hand washed piece is still quite blue, but that tells me that it is also likely to bleed if subjected to moisture, whereas the bolt is far less likely to bleed on anything now that it has been so thoroughly washed in both cold and hot soapy water. Another bolt I acquired in the same order, a lovely purple striped cotton, did not fare so well. It offloaded an abundance of fine lint, but no dye in its first rinse. So far, so good; but when I picked it up to wring it out, it ripped. Fascinated, I picked at it in different places, ripping the poor thing to shreds along the warp with very little effort at all. 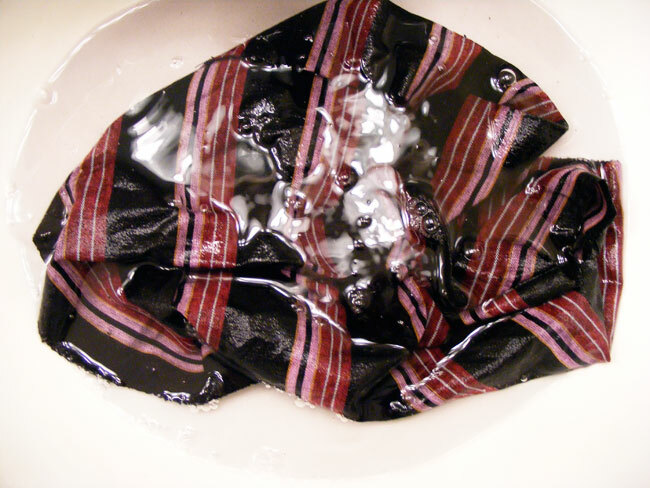 Standing at the sink with dripping strips of purple and black cotton in my blue-dyed hands, I reminded myself that buying from Japanese textile dealers who do not speak English while I speak very little Japanese is perhaps more risky than I’d like to believe. I removed the fabric from the sink and plopped it down beside the first piece outside in the morning sun. 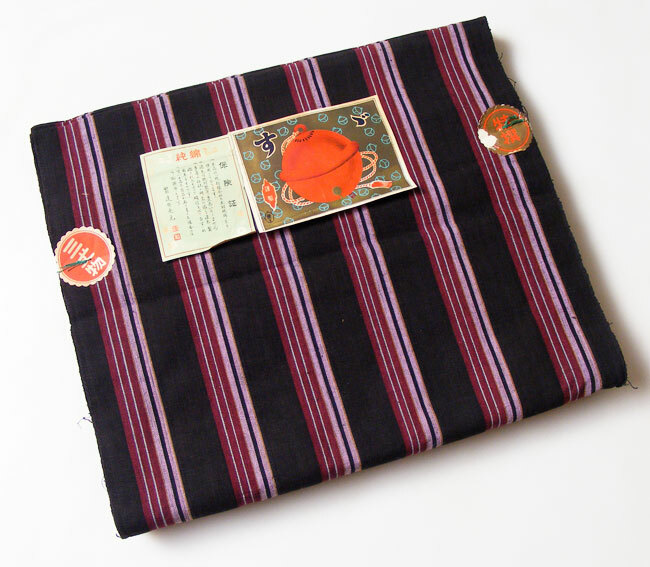 I may hold on to the purple bolt to use in weaving a sakiori project at some point. I can’t think of what else it may be good for, considering how weak the washed fiber is. The unwashed fabric is quite sturdy, so perhaps another use that does not involve immersing it water would be safe enough. I could always make a hanhaba obi out of it. If you have another suggestion, let me know. Bottom line: if you plan to wash your vintage fabric at any time in the future, wash it carefully before you even get started on your project. This is good quilter’s common sense, but not for all fabrics on all occasions, I know. 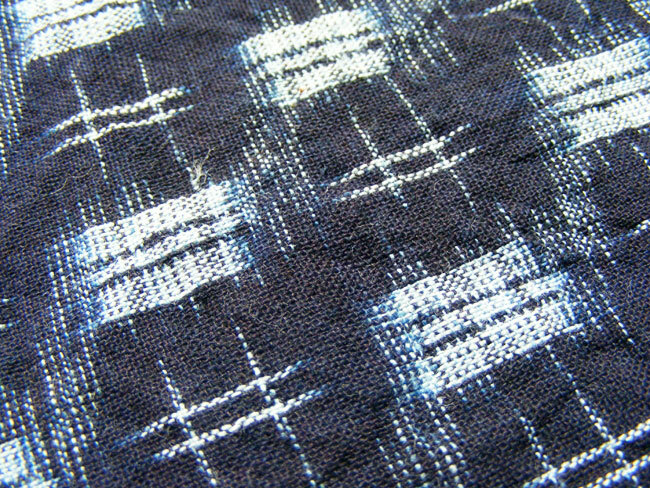 For example, it is traditional to sew a sashiko piece before washing the fabric to allow the fabric and thread to shrink together in the wash after completion (this works only if both the fabric and thread are of Japanese manufacture, I am told). If I had done that with the indigo fabric above it would have resulted in blue dyed thread, which may have been an interesting touch. Next up, more book reviews. Yes, it’s true… in lieu of a social life, I have a library.